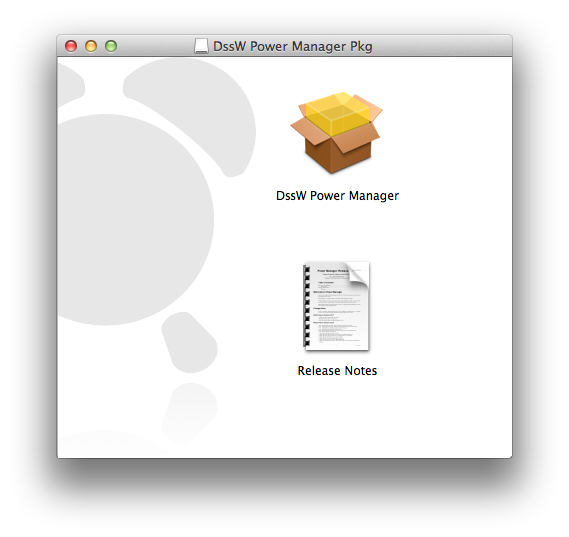 Installing Power Manager on remote Macs is possible, even without special network administration software. In this recipe we show how to install Power Manager using Mac OS X's built-in tools ssh and installer. If you are deploying Power Manager over large numbers of Macs, consider using a specialised tool such as Apple Remote Desktop (ARD) or radmin. Most seasoned tools support mass package deployment. The method we are looking at today is ideal for home and small office networks where justifying the cost of additional tools is difficult. You will need ssh, secure shell, access to the target Mac and you will need administrator access on the target Mac. Power Manager is available as a packaged installer designed for network deployment. The self-contained single package contains everything needed to set up Power Manager. These two commands will download the latest Power Manager package from our web site and mount the volume. scp '/Volumes/DssW Power Manager Pkg/DssW Power Manager.pkg' admin@192.168.0.2:/tmp/. With the installation complete, Power Manager is now installed but not yet running on the target Mac. The best option is to restart the target Mac - or wait until the Mac is next restarted. On powering on, Power Manager will automatically start and be ready to use. You can avoid restarting the target Mac. Any active users will need to log-out and log back in to see Power Manager's notifications. A few seconds after issuing the launchctl command, Power Manager will be available on your target Mac. This article was posted in PM4, Power Manager, and Recipe and tagged network, deploy, install, remote, and command line.